Made with just a handful of delicious ingredients, Pear Melba with Roman Raspberry Sorbetto makes an elegant finish to any meal! Serves 4. Peel, halve, and core pears. Rub with lemon juice to prevent discoloration. In a saucepan, stir sugar, Madagascar Bourbon Vanilla and water over low heat until sugar dissolves. Add pears and poach for 8-10 minutes, until tender but still firm. Remover pears from poaching liquid. Place two pear halves, cut side down, in each of 4 serving dishes and allow to cool. Put ½ cup poaching liquid with half the raspberries into a blender and purée until smooth. Pour purée into a bowl through a strainer, fold remaining berries into the strained purée, and chill. 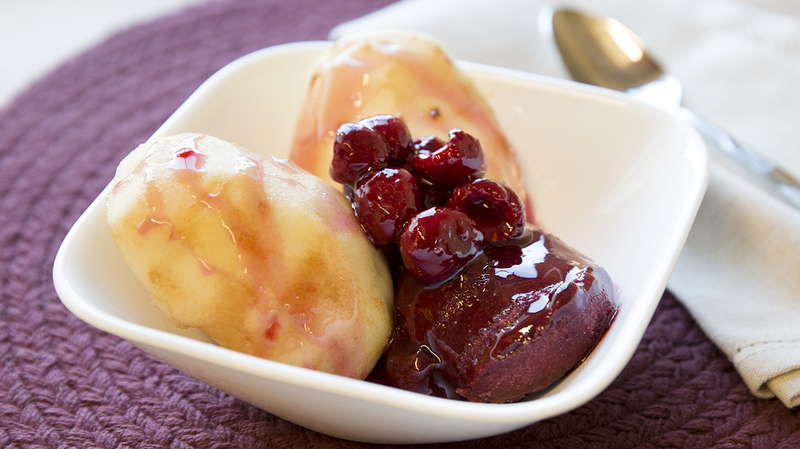 Add a scoop of the raspberry sorbetto to each serving of pears. Drizzle pears and sorbetto with raspberry sauce and garnish with mint.